This three-minute video entitled “Suku Bali,” Jonny Micay shows us scenes, beautifully shot and edited, from around Bali. Through his Micay’s lens we see fishermen’s boats in Jimbaran, the jagged cliffs of Uluwatu, the chanting of kecak, strolls through the pasar, prayers at temple, farmers working the field, among other settings that are just so typically and uniquely Bali. Definitely a nice little sampling of Bali. If we weren’t already here, we’d definitely want to take a trip after watching this video! Hire an English-speaking personal driver. We have been going to Bali for almost 20 years and we always call on our friend Wahde, who is like family to us, so we highly recommend his services. Whether you are interested in shopping, visiting temples, going from one side of the island to visiting healers, teachers and even Brahmans. Wahde has always been there for us. Contact Wadhe on his mobile: +62 813 3834 9954 but it is best if you contact him a few days in advance so that he can accommodate your plans. You can also send him a message through Facebook at: https://www.facebook.com/wahde.giriasrama. He is a safe driver and can take you to all that Bali has to offer. He also can give you tips on where to stay, shop and where to avoid as well as give you some tips about the secret culture of Bali that most tourist might miss. Having a driver will save you time and money as most of the tourist attractions in Bali can be hours away from each other and there are alot of drivers that are looking for unsuspecting tourist to take advantage of with high fees and other scams so it is best to go with someone you know or are recommended. Taking multiple cab rides might also hurt your pocket. Shop for souvenirs and pasalubong in the Tanah Lot area. If you do buy your souvenirs at Bazaars as chances are, you'll be paying for them 3-4 times the normal price so be sure to haggle as it is considered good business. Shops that offer fixed prices can be found outside the Tanah Lot complex. Some places such as the Tanah Lot complex you do not need to haggle as prices are amazingly cheap. Avoid traffic jams. Do this by leaving your hotel early and going against the tide of tourists that go to spots at a certain time. Wadhe can assist you with planning your travels so feel free to ask for his feedback. Staying away from the tourist hot spots and going out of Kuta is what we prefer to do. Ubud and even Lovina are alot more relaxed and relatively more cultural. We have many sarongs over the years but you do not need to buy a sarong. If you need one to go to a temple, most have vendors outside who will explain that you need them to enter the temple and will encourage you to buy from them. It's true that most temple administrators will not allow you to enter without a sarong. It is a sign of respect and a demonstration of your own gratitude to the people of Bali, their culture and ancestors to wear suitable clothing. In some instances, some of the public temples charge entrance fees that include sarong rental so there is no need to buy your own. Unless you're like us and want to bring one home as Balinese sarongs do have beautiful designs. If you're in Bali for some relaxation, stay in Seminyak. For partying and wild drinking nights, Kuta is the place for you. Check out our exclusive range of villas to make you and your friends stay even more unforgettable. If you're looking for a more artistic type of retreat, it will be best to stay in Ubud. A more remote destination for the more familiar is Chanti Dasa or even Lovina in the north in Singaraja. Bali certainly has something to offer for everyone. Make friends, do some shopping, soak up the culture, history and you will quickly discover why this secret paradise destination is so unique and why so many people consider it a spiritual home. Have lunch at a buffet restaurant over looking Mount Batur. The village of Kintamani the which is about 1,500 meters above sea level offers a breathtaking view of the active volcano and the serene Lake Batur. The view over lunch in Kintamani is breathtaking. In Bali, art is a way of life. Paitings, scupltures, carved driftwood, prints, dance and healing is practiced throughout the island in its traditional and modern forms. There are many places to purchase art work but it's always best to keep your haggling skills in tow. Though the art capital remains to be in Ubud, Seminyak also has beautiful art shops. Art is found in every nook and cranny of Bali but Ubud remains to be the art capital of Bali. 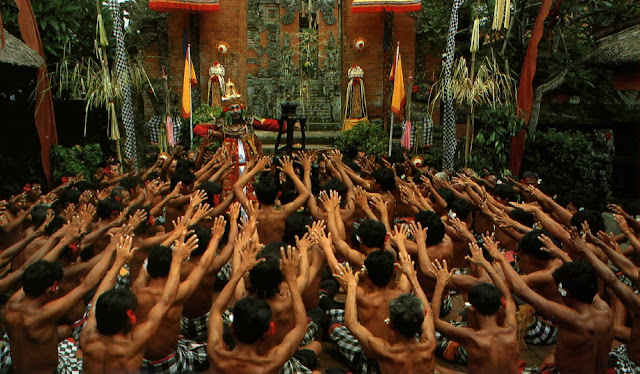 Although many people do not realize that art is engrained in the spirituality of the Balinese. Even their daily offering to their ancestors at home or in temples to the way they dress, walk, smile and communicate. This is the secret as to why these people have such a rich culture that is foreign to most tourist but makes them fall in love with Bali. Bali coffee is so dark and rich most people take some home just for the nostalgia. Want to see how coffee is made? You can, in Bali. Go visit a local coffee farm. They have Numerous coffee plantations on the island where the farmers can give you a tour and teach you the process of making coffee. They will even let you try grinding coffee beans the local way. After the tour, you can taste different types of coffee grown on the island - vanilla, Balinese, ginseng, coconut, and even Civet coffee (Kopi Luwak) , Among others. Though the Angkor Wat is arguably the most famous ancient temple in Southeast Asia, Bali's Hindu temples scattered all over the island can give world heritage site Angkor's some healthy competition. Bali is known as the "island of a thousand temples," Bali boasts beautiful, intricately designed temples that date back to as early as the 10th century. Bali's spiritual tradition is generally know to be Hindu but it is much more richer when one inquires deeper. For example, they do not necessarily call themselves Hindu but are referred to as Civa Buddhist but for now you will need to investigate this for yourself. It's impossible to see all of Bali's temples as there are over 600 during a short stay so it's best to pick the ones you want to see before your trip to save you some time. Do not forget to consider the temples' distances from each other as some can be hours away. Basaki Temple is know as the mother temple and is the largest and one of the most beautiful temple in Bali. Seated at the foot of Mount Agung this temple is truly breath taking. The Tanah Lot by the sea provides a dramatic backdrop off the windy road driving north from Kuta. This temple is one of the most popular attractions on the island. It sits on top of an offshore rock formation shaped by waves through the years, and is only accessible during low tide. It's believed to have been built during the 15th century when the traveling Hindu priest Danyang Niratha chose the area to rest. Legend has it that he asked the fishermen living in the nearby village to build a shrine on the rock for the sea gods. Before he left, Danyang Niratha left his scarf as protection, which locals say that the scarf turned into a giant snake. Locals and tourists sometimes spot sea snakes near the temple and are well know as the temple's protectors. The Ulun Danu Bratan sits on the edge of Lake Bratan, basking in its tranquility by the lake. Between the mountains of Bedugul is a temple overlooking Lake Bratan - Ulun Danu Bratan the. Believed to have been built in the late 1600s, this temple is dedicated to Dewi Danu, the Balinese Hindu goddess of water. Lake Bratan is located 1,200 meters above sea level and has a cool, tropical climate. The lake is also called "Lake of the Holy Mountain" due to the abundance of nature in the area. The deeply spiritual people of Bali bathe as do tourists themselves with the holy water that is believed to have healing powers. The sacred springs of Tirta Empul are located inside Siring Temple Attract not just for the Balinese, but also tourists. Believed to have healing powers, the fountains were built over a natural spring in the year 926 AD under the rule of the dynasty Warmadewa. It has shrines for Hindu gods Brahma (creator), Shiva (destroyer, transformers), Vishnu (preserver of life), and Indra (lord of heaven). The structures inside the Sacred Monkey Forest in Ubud look like an image straight out of Temple Run. Inside the Sacred Monkey Forest are hundreds of crab-eating Macaque more than happy to be photographed. They jump around and ask tourists for food. If you're visiting the forest, do be careful as the monkeys have the tendency to grab and take away small items like sunglasses, cellular phones, and food you intend to eat yourself. Within the forest, you can also find a holy spring water temple and the Padangtegal Great Temple of Death where you can let out your inner Indiana Jones. Bali is known for its beaches which attracts a lot of tourists from places all over the world. It's unique culture and tropical paradise make it a popular destination. During the month of October, beaches in Bali are less for swimming but more for surfing. So whether you lounge around on a beach chair sipping on a world class cocktail or on the sand to do some sun bathing or relaxation you can listen to the sound of the waves washing away all your troubles. For the surfers amongst you the Bali waves especially this time of year are world class and there are many touring companies that offer the die hard the opportunity to do some ocean surfing. Bali is referred to as the "Island of the Gods & Goddesses". Discover the paradise the Bali is and be awakened to the rich culture and island retreats that only Bali can offer. Stay for a few day or weeks our large community of expats have made this place home for a reason. Bali Villa Home Rentals provides you with a choice of luxury villa home for you to stay with family and friends in some of the most sought after destinations in Bali. Book your Villa in Paradise here. For a tourist destination that has a little bit of everything, Bali is was such a welcoming change of environment and culture with its relaxing atmosphere and smiling people. Whether you soak some sun by the pool, drink cocktails, do some shopping, get pampered with a traditional massage or simply enjoy the local food there is always something to tantalize the senses like no other place in the world.